When you think of a backyard summer barbecue, what immediately comes to mind? Is it plastic tablecloths, sticky fingers, and plastic serving dishes? Or is it instant excitement to put together a beautiful tablescape and unique summer menu that friends and family will remember? 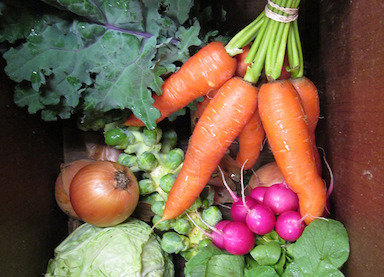 With Memorial Day right around the corner and the unofficial start of summer, we are excited about outdoor entertaining and trying non-traditional seasonal dishes. 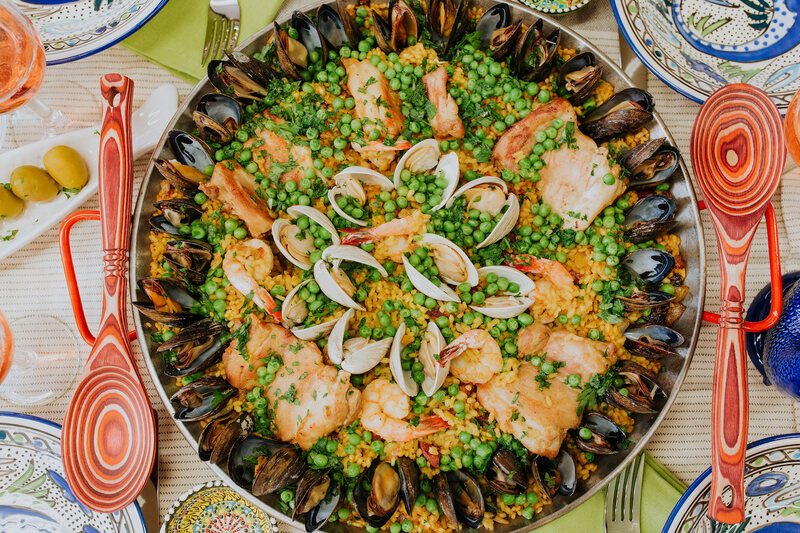 At the very top of our list is a mouthwatering seafood paella that is beautiful and a great meal to feed a large party. 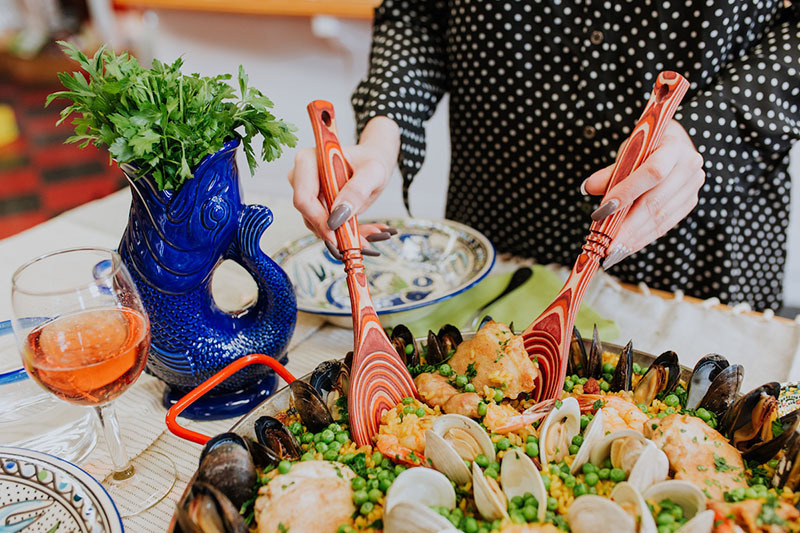 To go along with this tasty & colorful dish we’ve put together an eye-pleasing tablescape and listed our top entertaining tips for hosting an elevated barbecue this summer. Ditch disposables and opt for pretty ceramic serving dishes, plates, and utensils. Even if you don’t have time to do anything else on our list, this simple switch makes a big difference. Plus you’ll be surprised by the ease of cleanup when you load all the dishes in the dishwasher at the end of your event. Instead of plastic solo cups and large soda and drink bottles, try to serve drinks in a glass dispenser for larger crowds, or a simple pitcher for a more intimate party. Although we used our bluefish pitcher as a centerpiece, it is fantastic for serving drinks at the table. Another tip is to jazz up ice cubes with edible flowers, herbs and/or fruit. Your guests will smile. Let’s be honest, most guests aren’t expecting a thoughtfully designed table with a cohesive color palette when they get invited over for a barbecue, so get ready to wow them. 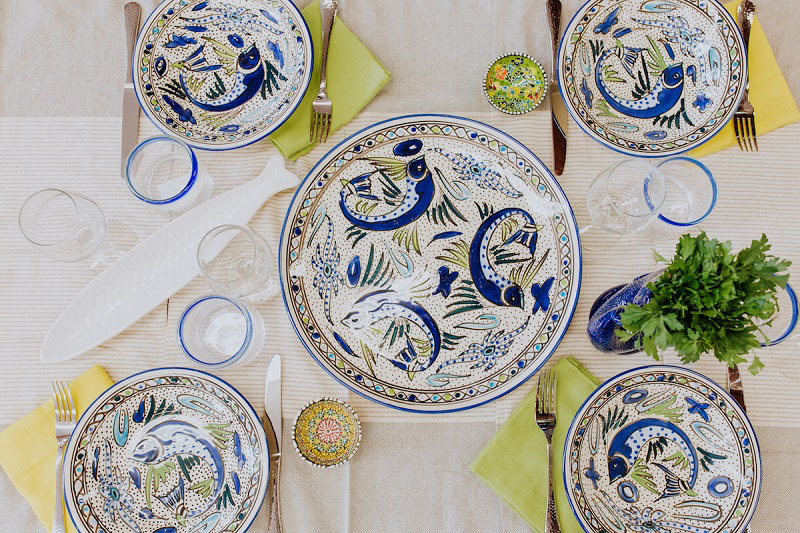 We’re personally smitten with these Le Souk hand-painted ceramics from Tunisia. 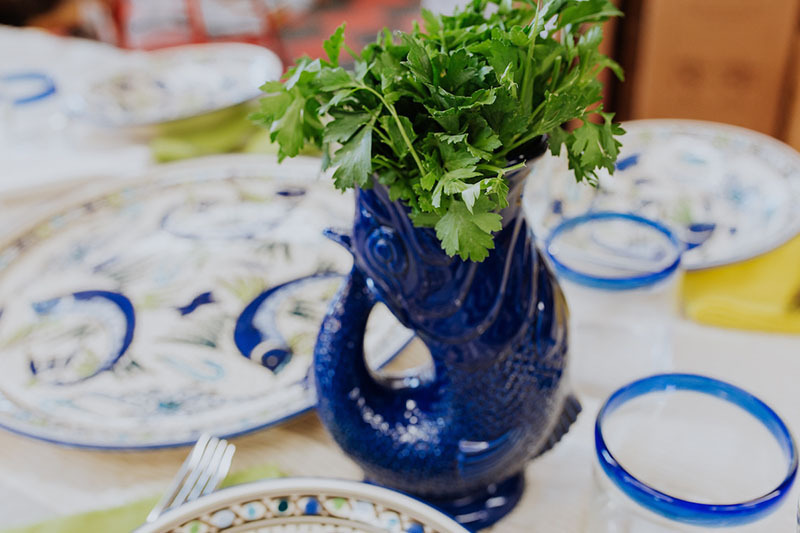 The green and blue fishes make for a summery coastal feel, perfect for a New England summer barbeque. Add dimension to your table with fresh flowers, candles, and textured linens. It’s time to change up your standard barbeque menu! Rather than typical backyard barbecue food (aka grilled burgers, chicken wings, potato salad, chips, etc. ), try something different with seafood and/or fresh fish, serve your meat on skewers, opt for a wedge salad instead of a chopped version. 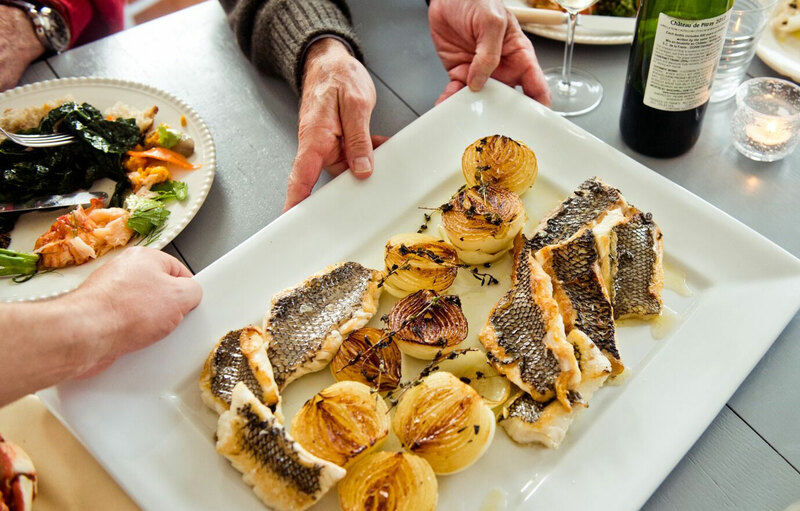 Guests will be super impressed by the sophisticated spread, but really these recipes can take the same amount of effort as the standard barbeque menu. 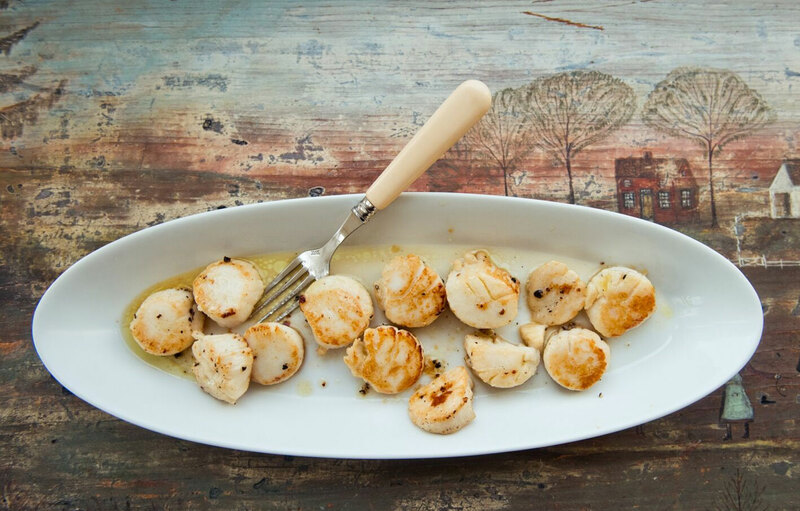 Being from the New England coast, we tend to favor summer classics like lobster bakes, pan seared scallops, and sea bass. 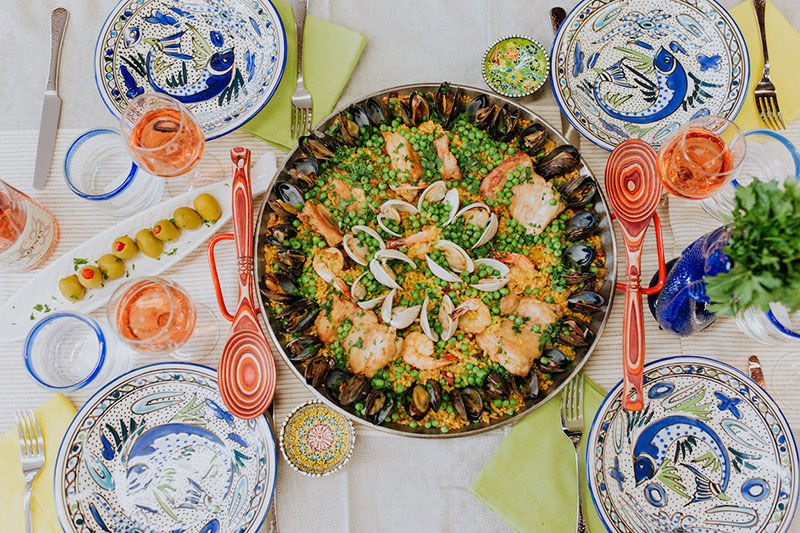 Of course a seafood paella, in our opinion, is a go-to showstopper for any summer soiree. To source the highest quality local seafood we recommend some of our dear neighbors; Harbor Fish, close by LeRoux Kitchen in Old Port, Maine; Sanders Fish Market in Portsmouth, NH; Scarborough Fish and Lobster in Scarborough, ME; The Clam Man in Falmouth, MA and The Net Result or John’s Fish Market in Martha’s Vineyard, for they carry delectable, fresh clams, mussels, and shrimp that takes this paella recipe to the next level. To go with the food, create a drink just for the event. No matter how simple, this makes the gathering feel more special. Offer a choice between a tasty, fresh fruity cocktail such as sangrias, margaritas and mojitos. Or keep it easy and stock up on your favorite wine to share. 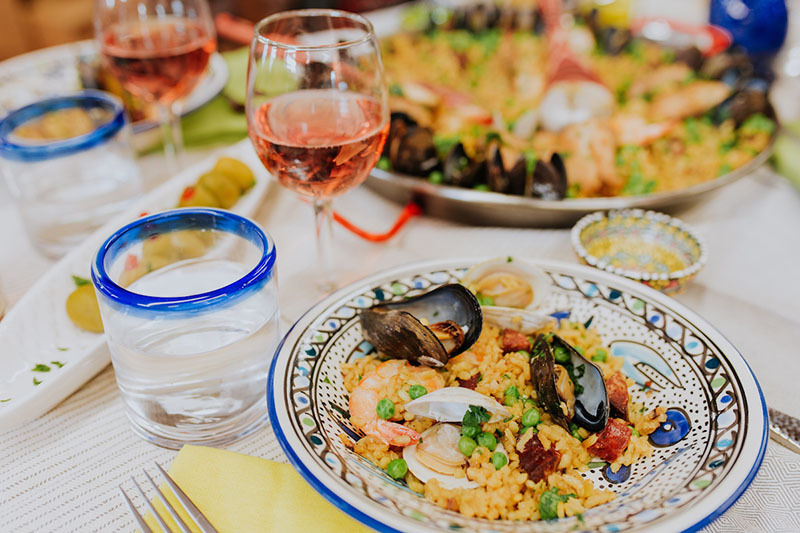 If making a seafood paella, we suggest a cava rosé as the perfect pairing. 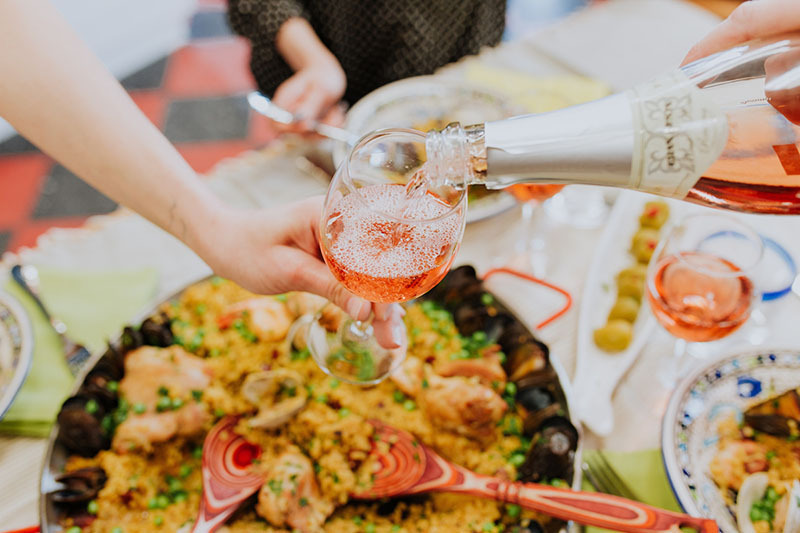 Cava rose originates from the same geographic area as paella and its bubbles help cleanse the palate between bites of the deeply flavorful dish. 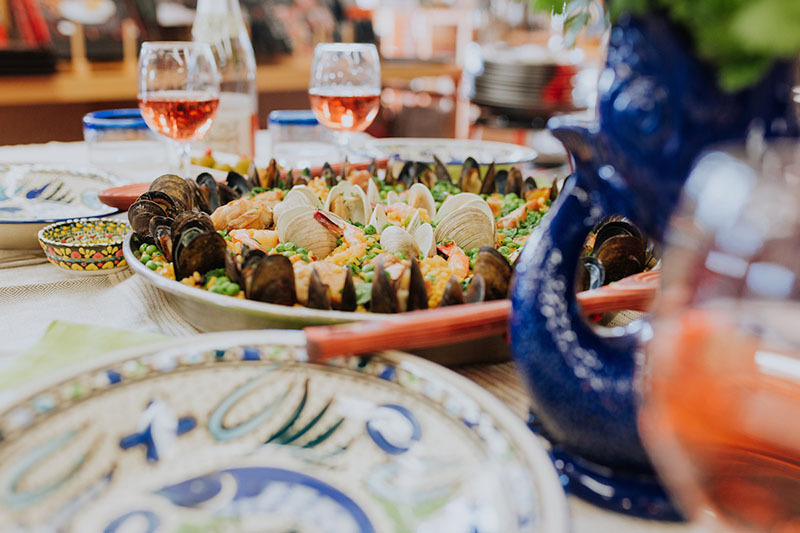 The slight sweetness of the cava rose offers a good balance to the heat and fat of the paella. So there you have some suggestions for a unique, easy and pleasing outdoor meal to share with friends and family. Let summer begin!